Determine the damage area requiring repair. Locate and cut the damaged beam section from height adapter leg section. Once the damaged section has been completely removed from height adapter, prepare the surface for welding per Structural Welding code AWS D1.1-90. The remaining beam flange(s) must be fully beveled at a 45° per Full penetration groove weld detail as shown in detail. 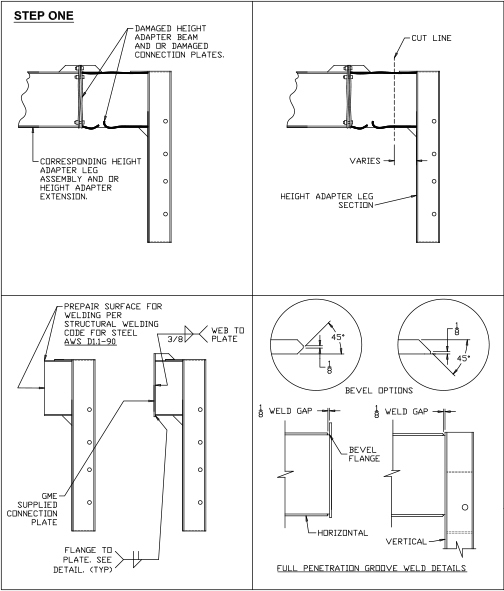 Once all the above steps have been completed, weld GME supplied connection plate(s) per weld details shown to appropriate beam section(s).